In the same lyrical voice that met with such acclaim in Landscapes of Wonder, Bhikkhu Nyanasobhano invites us to look upon the natural world with new eyes and to find the truths of the Buddha's teachings in our immediate experience. Attentive to the subtle power of language, Bhikkhu Nyanasobhano choose his words in these essays with such artisty and care that Longing for Certainty resounds with sparkling, fluid clarity. 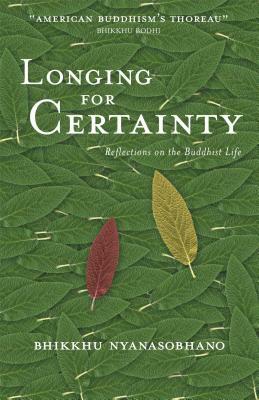 Bhikkhu Nyanasobhano has been referred to as "American Buddhism's Thoreau" and indeed, his ability to inspire his readers to discover the wonders of nature and the spiritual insights that they arouse is unsurpassed among modern Buddhist writers. Fans of his acclaimed Landscapes of Wonder, will find that Longing for Certainty moves into even deeper fields of reflection. Bhikkhu Nyanasobhano was an actor and playwright before being ordained in Thailand in 1987. He now lives in the United States.